If there’s something that upsets Border Police combatant Dudi Saido, it’s when people ask him how he became disabled. “When I say a car accident, they start with their comments: “Probably drunk driving’, ‘You were probably stoned’. But I say nothing. Except in my heart: ‘Yeah, right, sure’. Or another one says: ‘What, you flipped over?’ ‘No, a car ran into me’. Sometimes I reply: ‘A work related accident’. Because if people hear what really happened, right away they lower their gaze, and start feeling so sorry for me. I hate that. They start talking to me as though I were a little puppy, that’s when I really get upset. What’s wrong with you guys, talk to me normally, in your regular voice. There are also those who call me a ‘hero’ and I reply: ‘who’s a hero’? Heroes, you can only find those in graves. There’s no other way to see it, I was just doing my job and got wounded”.Up until the morning of August 11, 2003, Saido was just an ordinary guy: 24 yrs. old, living with his parents in Ariel, planning to rent his own place in Jerusalem, not far from his work place, planning to propose to his girlfriend of the past year and mostly: a tough man, eldest brother to his five brothers and sisters. But then, fate intervened: one of his buddies, a member of his squad, had begged Saido that morning to take his place in the next patrol scheduled for noon because he had to be in Tel Aviv for a recording. Saido, who at the time was serving as a career combatant in the Border Police, and normally no longer took part in routine security patrols, agreed without hesitation. 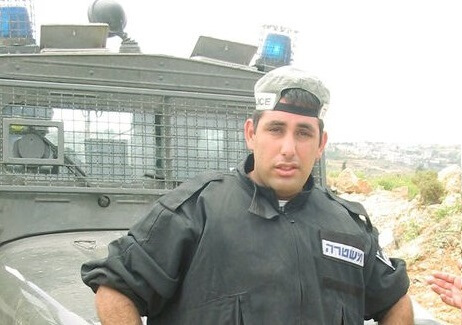 At 3pm that afternoon, there were three in the patrol jeep: Nadim Harb from the village of Beit Jann (a Druze village in Northern Israel) who had just returned from his honeymoon, Dudu Ben Lulu from Holon and Saido, the driver. They were in Jerusalem’s Neve Ya’acov neighborhood when they got word on their radio that a terrorist was trying to infiltrate through the Kalandia Check Point”. Saido recalls: “We were told to go there, set up a road block and check everyone arriving from the North, both on foot or by car’. We had no idea what the suspect was wearing, nor what he looked like. When we arrived at the main square in Kalandia I already noticed Border Police crews carrying out spot checks”. The last thing he remembers clearly is himself trying to back up and park and to the right of his armored ‘Sufa’ jeep there was a baby carriage. In the years which followed since that day when he opened his eyes at Jerusalem’s Hadassah Hospital in Ein Kerem and until today he has relied solely on stories told by his friends who were wounded less severely than him. “Dudu told me that he said to Nadim: ‘There’s something suspicious about the baby carriage’ , he opened the door and jumped out and at that same moment the explosion occurred. Dudu’s leg blew off and he got shrapnel and burns. Nadim and I got head injuries. I remained seated in the driver’s seat. People tell me I shouted “Mom, I’m burning’. I wasn’t really burning, just my head was burst open and part of my brain had spilled out”. Saido was rushed to Hadassah’s Ein Kerem Hospital in Jerusalem. He remained unconscious and resuscitated for three weeks. “They declared me dead three times”, he says. “Once they brought my parents into the room and told them to say good-bye to the kid because there’s not much time left’. It was then that my parents broke down, but then they were told my condition had stabilized and that I was out of danger. A second time something similar happened and a third time my father got a phone call: ‘Come urgently to the hospital, this is it, he’s dead’. There were lots of prayers and I came back”. However, returning back to life wasn’t easy. This strong, healthy man became 100%+ disabled: the entire left side of his body is paralyzed: his arm 100%, his leg 80%. “My speech is not what it used to be”, he explains, “My vision was hurt and I don’t hear so well in both ears, either. My short term memory was also affected. Sometimes I find myself saying in the middle of a sentence: ‘What was I talking about, or: What did you just ask me? But that was mostly in the beginning. Only recently did I get my driver’s license back because at first I used to get epileptic seizures. It’s been three years since I stopped having them”. The month he spent at Hadassah was difficult for the entire family. “I was tied down to my bed because I used to go crazy, trying to tear out the intravenous tubes. I had been the eldest brother, the strong one, always doing things for everyone, trying to set an example and suddenly, your sister has to shower you and change your diapers for you. Even today, subconsciously, they still haven’t internalized my injury. As far as they’re concerned they think I’m sometimes putting on an act. Especially now that I can do a lot more on my own they say to themselves: everything is OK. But in fact, I’ve become a very dependent person. It hurts that there are things I can’t do”. From Hadassah Ein Kerem Saido was transferred to the “Beit Loewenstein Hospital Rehabilitation Center in Ra’anana. “I heard the doctors telling my parents: ‘Right now he’s bed ridden, eventually, the best he’ll be able to do is get around in a wheelchair’. When I heard this I said: ‘I will not remain in wheelchair all my life. I used to go to physiotherapy treatments. I asked my therapist to teach my sister how to give me treatments and I’d do the exercises in my room. After a year, I went home on weekends and got rid of the chair. Today, I still have the chair but I rarely use it. It’s there and you never know, but mostly I hang on to it for long trips, certainly not for day to day. Beit Loewenstein was like a school of life for Saido, and not necessarily in the physical sense. “On my first day at Beit Loewenstein, when my father left me and went home, I cried. Then he said to me: ‘Listen, at rehab, you’re on your own with your pain. This is a battle without any protective gear, it’s your own conflict with yourself. If you can hang in there, you’re a true fighter and you’ll win’. Until this day, that’s my motto: ‘Have faith in yourself, fight and you’ll win. To get better, I used to walk the corridors at the hospital and read all the thank you letter people who had been treated there wrote. Then I’d say to myself: ‘If they got out of here, I will, too. I don’t like those who pity themselves and say: ‘Why did this happen to me?’ In order to succeed in life one shouldn’t always look for explanations of why things happen, but look at the present and from there grow forward. One lives in the present, but we look over to the past in order to succeed in the future. My psychologist gets upset when I use the words ‘in the past’. She says I make too many comparisons to who I was in the past. I feel it gives me strength to move forward because my reasoning is: ‘I used to be so and so, so now I have to get better at this or that in order to get back to who I was before”. A Border Police combatant, seeing a therapist – not exactly a natural connection. “That was one of my problems. At Beit Loewenstein I thought the psychologist was just wasting my time. After six months I realized that you can’t just bottle up everything inside. You have to unload. I began therapy and it took me time to understand that I really needed it. So what if I’m a tough guy, a fighter in a combat unit. I learned that being a combat soldier has nothing to do with it. Everyone needs treatment, especially after what I had been through”. In dealing with his condition, Saido decided about a year after his injury to return to the scene of the terror attack. “I was with my Border Police commander and I said to him: ‘Let’s take a little ride to Kalandia and see what’s happening there today. He agreed and we drove there. I noticed lots of things had changed, so much so I almost couldn’t recognize the place where it had all happened. For example, following my incident they speeded up the building of the security wall. Sometimes, I drive to Jerusalem through there on purpose. There’s something in my mind that tells me: Dudi, take a ride through there, see what’s happening. When I approach the road block, I feel the blood rushing through me and my thoughts saying: once I was here under different circumstances and today I return not as a policeman, without my uniform nor weapon. But the civilian Dudi Saido has returned here, alive. I won”. What do you know about the attack? The terror attack was supposed to have taken place in Haifa with an explosive device originating from Jenin. This intelligence was received by our secret services so the North of Israel was shut off with road blocks. The terrorists then tried to get into Tel Aviv, and since it was also sealed off they attempted to enter Jerusalem through the Jordan Valley. After that failed as well, they drove to Jerusalem through Ramalla, and from there finally succeeded in getting in”. “The terrorist who had set-off the device with a cellular phone was killed a month later in Hebron. I didn’t really care that much”. During the 2006 Second Lebanon War Saido was in the midst of his own personal rehabilitation, and suddenly he found himself in a position to help others. “I came to the families that were sitting at the hospital and brought them my photo album. I showed them how I was before my injury, how I was during my hospitalization at Beit Loewenstein and how I am today. I would cheer them up: ‘Be strong in front of your son and don’t show any weakness. If you project weakness, it’s all over’. Years later I met an amputee who told me: ‘My parents said you met with them and it really helped them help me in my rehabilitation”. In 2007 Saido lost his first battle when he tried to return to his previous place of work, the Police, and was rejected. His plight made it to court and was widely reported in the press. “I was promised I would be able to return to service, but the Police physician decided I was not fit to serve. It really hurt. I had lived and breathed the Border Police 24/7 and saw them as my second home. I loved my work, my colleagues and, suddenly I’m told I’m not fit for the job. I felt betrayed. After the terror attack the Commander of the Border Police had said: ‘My men are the country’s protective shield’, yet he wouldn’t take me back… It’s as though someone said to me: ‘You’re worth nothing now’. This is how I felt”. Saido’s claim was rejected, and today he is a retiree of the Police Force. Thinking of himself as such makes him laugh, but he did find another way to remain connected to the system: He takes part in delegations organized by the Police, he helps organize trips and parties for casualties of the Police Force and he gives lectures to soldiers in Border Police basic training. “When I talk to the new recruits, I tell them that I dreamed of serving in the Border Police. Like them, when I first arrived at the basic training base I was in shock, but this is where I say to them: ‘It’s here that you will be receiving the tools for life and you will strive to move forward. I was wounded doing my job and you are here for the same purpose. After my injury I was decorated and the President of the State of Israel congratulated me and asked if I had any regrets. I replied that I would do everything over again exactly the same way”. Eight years later, Saido’s rehabilitation is still a daily struggle. “Taking a shower seated on a chair, wearing Velcro shoes. It took me about four years to get used to using only one hand in simple things like: putting on your socks, wearing the brace on my leg. Putting on my jeans or buttoning my shirt. I asked people in my condition, and they said: ‘Do it on your own, be creative’. So I tie bags with my right hand, I use my teeth a lot, too. It was always important to me to fold my clothes neatly in my closet, just like in the military. At first it didn’t quite work out but after a lot of practice with the help of my mother and sisters, today my closet looks like a soldier’s. I have day treatments at Tel Hashomer Hospital and I arrive regularly at Beit Halochem to work out in the Fitness Room and for Hydrotherapy treatments. Recently, I signed up through Beit Halochem to the Wall Climbing Club and the Rappelling Course. I spend a lot of time at the Young Veterans’ Club at Tel Aviv’s Beit Halochem, going to their parties and events. Most of the participants at these trips and parties are disabled veterans, wounded in the Second Lebanon War and from Gaza’s Operation Cast Lead. I’m one of the oldest participants. Here, too, it gives me an opportunity to cheer them up. I know they arrive sad but leave happy”. And who cheers you up? “I cheer myself. I’m not one to share. Up until my injury no one knew my weaknesses. Only my strength. I was always the tough and funny guy. I have thoughts that lead me to moodiness but then I wake up and realize where’s all this going to get me? In my vocabulary, the words ‘if only’ don’t exist. They never existed before I was injured but all the more so now. ‘If only’ I hadn’t joined the Border Police or ‘If only’ I hadn’t taken the cab or ‘If only’ Nadim hadn’t opened the door. It goes on and on. ‘If only’ are irrelevant words to me especially since good things, too, happened to me as a result of my injury. I’ve traveled abroad a lot and seen the world, met lots of wonderfully amazing people, who have taught me that I’m not alone in this new situation. I also got to know myself all over again. I never knew I was so strong mentally and physically as well, but mostly emotionally. Suddenly, I realized who my true friends really were. Already at the start, some of them distanced themselves. They said it’s hard for them to see me like this, when they’re used to seeing me differently. But to me that was just an excuse. After all this time I just realized I just didn’t figure in their lives. They only wanted to hang out with me at parties and to have fun. It’s no longer as much fun to be with me as before … we tend to label people and I’m now labeled: ‘disabled’”. How do the girls accept you today? “They hardly do. It’s difficult for them to relate to an injury like mine. Easier for them to relate to someone who has lost an arm or a leg or even to a paraplegic in a wheelchair as long as the head and the brain remain intact. When girls hear my speech impediment or find out about the epileptic seizures, it turns them off. How can I explain to them the last time I had one of those seizures was more than three years ago … So I meet girls through friends and on Facebook. After my appearance on TV following my lawsuit I was also contacted”. Do you see yourself marrying someone disabled? “I don’t have a problem with that. Any disability, except PTSD, that’s really too difficult to deal with. I don’t really relate to myself as being disabled, I rather prefer physically challenged. Today, I think that as early as at Kindergarten kids should be taught the difference between being called ‘crippled’ and being physically challenged. Being a ‘cripple’ is almost like a curse. It’s certainly a negative stigma one which I, too, had used. Today, I know the meaning and think that children should already be taught that there are such people and this is how one should relate to them”. Do you keep in touch with Dudu and Nadim? “Over the phone. Sometimes I bump into Dudu at Tel Hashomer”. What about your buddy whose place you took in the patrol that fateful day? “He took it very hard. He was scared to come near me. One day we got to talk and he said: ‘I was afraid of your reaction’. I explained that there’s nothing to be afraid of and that I was never angry with him, that it’s OK. What has to happen happens. After that I found out he had become a Born Again Jew and was now ultra-orthodox”.